A vacation on the beach is an ideal way to let down your hair and relax. Those who love the beach and water sports are fortunate to have many places to turn to. One of the most popular towns for a long and relaxing beach vacation in Myrtle Beach, South Carolina. This seaside town is centrally located, making it an easy trip from many major US locations. Spending time here also allows vacationers to indulge in all sorts of activities both on land and along the miles of white sand beaches adjacent to the town. A trip to this region can be the perfect way for families to spend time together riding a jet ski, going on a dolphin cruise or renting pontoon boats. Myrtle Beach is the perfect place to spend time in the water. The many beaches in the area have places where people can pick the kind of waves they like. One person may prefer gentle surf of the Intracoastal Waterway while another looks for something a bit more challenging. This region also makes the perfect place to go jet skiing. Myrtle Beach jet ski wildly popular where Jet ski rentals are widely available in many places including Action Water Sportz. Anyone can learn to jet ski even if they have never gone jet skiing before in their entire life. You can also go fishing or go on a dolphin cruise with Action Water Sportz or rent a pontoon boat. Coastal South Carolina is the ideal place to see wildlife as well such as dolphins. The mild climate makes it easy and pleasant to be outside for much of the year. A beginner can learn to jet ski by taking advantage of the many available jet ski rentals in the area right along the shore. 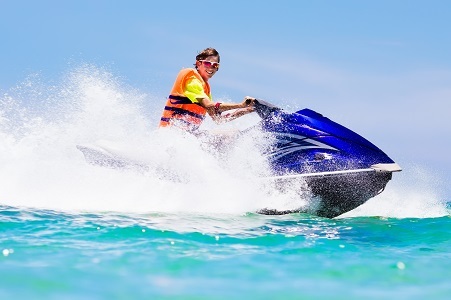 Action Water Sportz offers instructors with many years of training who can help provide the kind of assistance that people need in order to master the basics of a personal watercraft. After a few lessons on a sunny morning, many vacationers are delighted to find they have mastered the basics of the sport. Instructors are very happy to work with people of all ages including both young children and seniors who may not have set foot in the water in many years. Getting into the warm waters here and jet skiing can make the perfect break from the long winter blahs. A day spent on the waves with a jet ski is also a great way to cool off during the hotter summer months. Watersports of all sorts make the ideal way time to spend family time together. This is true of water skiing, fishing and dolphin cruise with Action Water Sportz. Younger children are often delighted to realize how they can get on a pair of skis and then skim over the water staring at magnificent sea creatures like dolphins. Older children will quickly find that Myrtle Beach jet skiing is the perfect time to master new tricks if they have been water skiing before. The entire family can spend time on the Atlantic Ocean learning to feel more comfortable being in the water in a safe and supervised family activity. A child must be 16 years of age to a jet ski by themselves. Younger children can enjoy a ride with a parent or older sibling. If you want a nice place to stay with a magnificent oceanfront view, you can rent out at OceanFront Condos. Here you can still enjoy the view of the Myrtle Beach coastline and admire the wonderful sunset with your special one. Another advantage of spending time in Myrtle Beach is the great golf courses and the opportunity to spend quality time outdoors. You can get great discounts with a weekly golf membership from MyGolf . Did you know that Myrtle Beach has one of the best golf courses in the country? Do not worry about going around from your condo to the golf course because you can always rent a golf car in Myrtle Beach, with Best Golf Cars. What more can you ask for a memorable vacation, when you can all have it here in Myrtle Beach. Be sure to book your next summer vacation here now. Call Action Water Sportz today to reserve your personal jet ski or to take a dolphin watch tour. All jet ski rentals are accompanied by a trained instructor. This makes it ideal for the first time watercraft user.